the Rex hamster (pictured below). Both of them are Syrian hamsters. 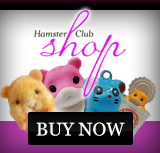 These types of hamsters are also known as Teddy hamsters. 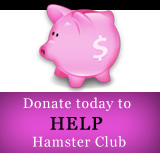 Male hamsters usually display a more prominent mane of longer hair around the neck. 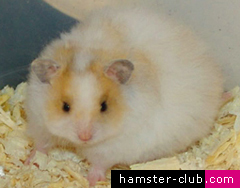 The overall quality of the coat is very important and the fur should fall evenly down the sides of the hamster�s body. Also the longer fur at the back is most of the times referred to as the 'hamster skirt'! 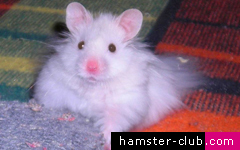 Rex Syrian hamster�s mutations cause the long guard hairs in the coat to be much shorter than usual, with a wavier pattern. Also the hamster's whiskers tend to be curly. The picture on the right shows a Rex hamster. In the past Rex Syrian hamsters were considered as unattractive but today breeders see them as very appealing and distinctive hamsters. Remember that long haired hamsters must be brushed with a brush specifically designed for hamsters or with a clean toothbrush.